An extra rear bike rack just became my new front rack without much effort or extra hardware. But is it good enough for carrying some of the load next tour? It’s time to take advantage of physics and common-sense and redistribute some of that up front. The rack faces inwardly, just as it does on the rear. I have two panniers hanging on it in this picture mainly to demo what it could look like… these are Ortlieb back rollers, so they’re a bit bigger than your typical front bags. The real trick, of course, is how to mount it. For the moment, I used the hardware that I used on the rear and nothing more. In order to get enough clearance for the brakes, I needed to mount the braces on the top rather than the bottom of the rack. I also had to bend the holy hell out of them, but the crossing action seems to provide a sturdy mount via the upper fork. The bottom of the rack attaches at the mount point at the bottom of the fork. 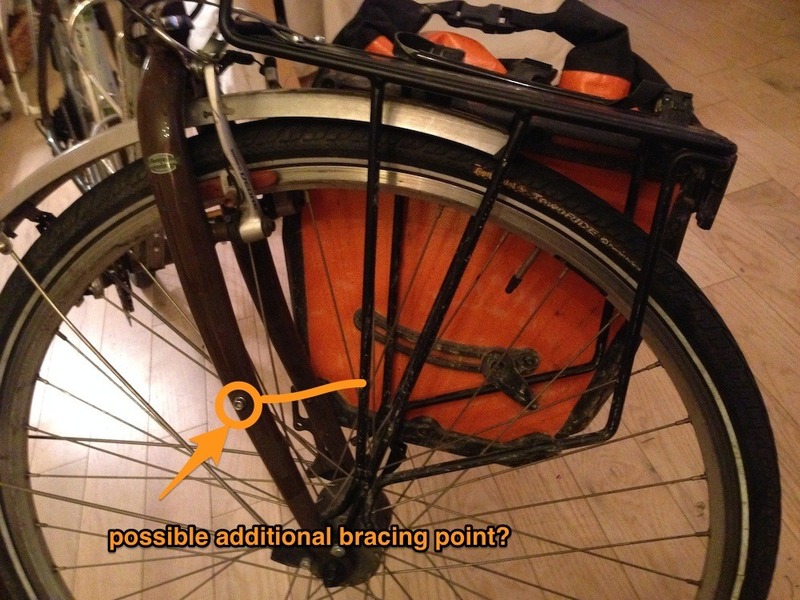 Because there’s an additional brazon relatively close by, I can foresee bracing the whole thing with a cross beam… perhaps even using two water bottle cages to get a little extra function, so long as it gives actual structure. I took the bike for a quick spin in the snow today with my 9 lb city lock bungeed to the top platform to see how it felt with a moderate weight. Everything rode fine, even with the newfound oddity of having weight at that point in the bike’s geometry for the first time. – I don’t think it’s a good idea to ride with more than 10 pounds on this current system… those mounting brackets probably bear weight differently than when on the rear, so the flex of a heavier weight could muck things up. – I can fix that with a secondary bracing like I mentioned above. 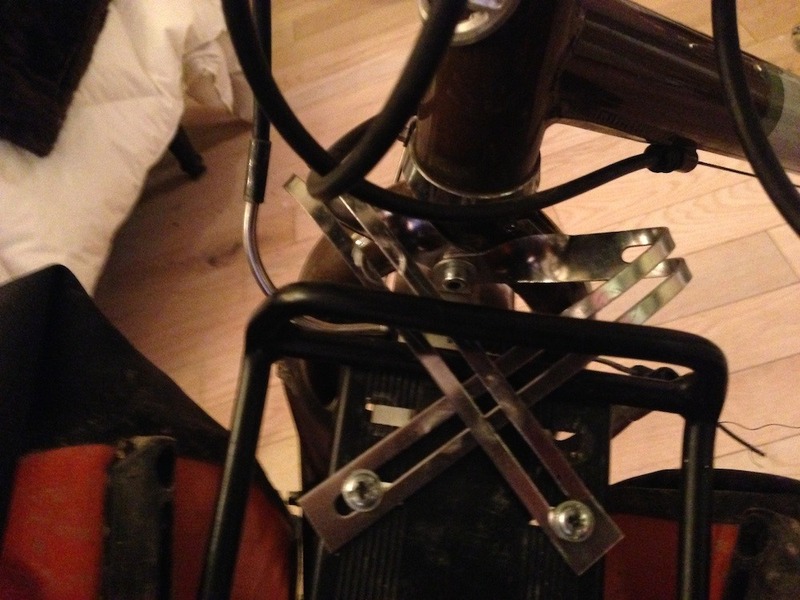 It will probably mean using some P-clips to attach the rack to the brace, and then the brace would fasten at the mid-fork. 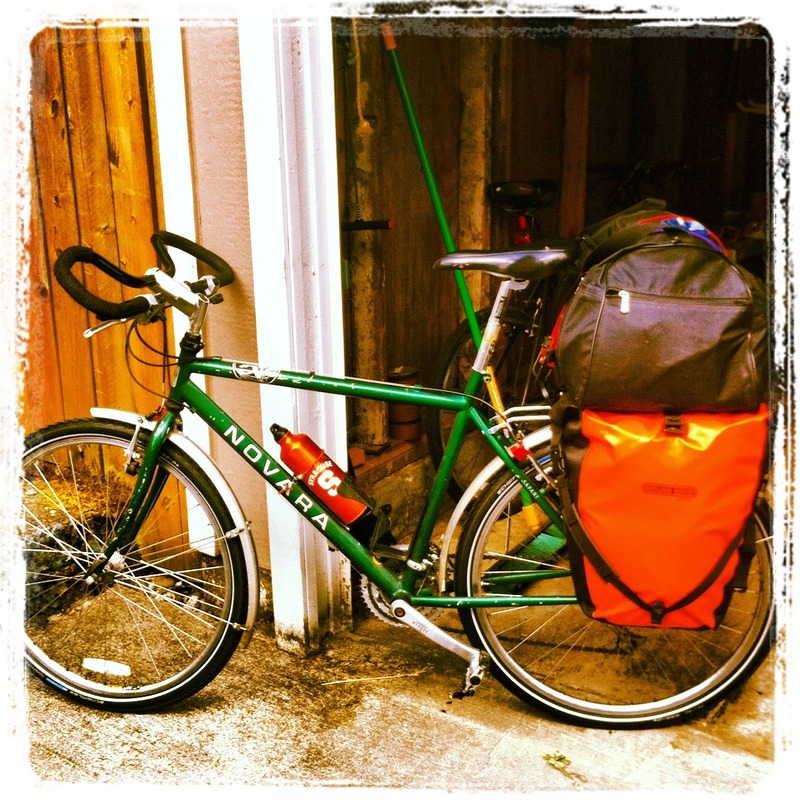 – I’m back and forth on using the platform or getting front panniers. I think the panniers riding lower would help distribute the overall weight better, and I did just save about $50 on a rack, right? 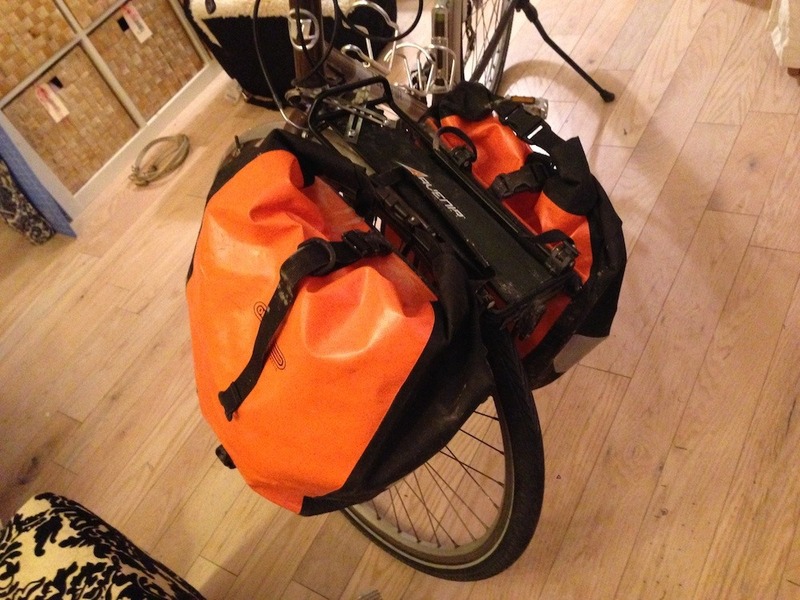 That said, a dry bag bungeed on the platform (like this, although he attached front panniers too) would probably do the trick too… again, I’m not too cheap to get these things, but why not save a few bucks if form and function are served? More to come on this project. What kinds of hacks have you been up to lately?